To be productive in terms of energy, a building must produce more renewable energy than it consumes. We use a graphic scale describing the energy performance of our buildings (at right, the example of Solar 2). This scale is measured per square meter, not in terms of the total consumption of the building, to allow easy comparison between buildings. Other data analyses are sometimes measured in different units, such as btus/square foot. Conversions between units can be found at a number of web sites. 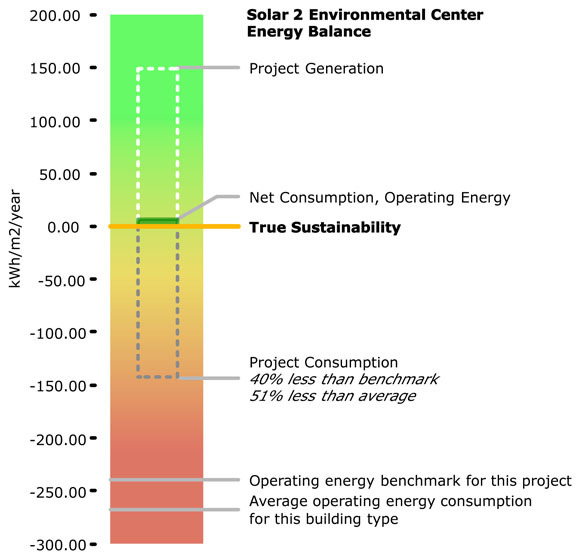 Energy use within the building is labeled Project Consumption; energy generation is labeled Project Generation, each indicated by a dotted rectangle. Consumption is a negative number, production a positive. Adding the two gives a net total. If production exceeds consumption, the total is positive, and the building produces a surplus of energy. Building energy consumption and production are highly dependent on two factors: building type (i.e., office, residence, restaurant), and climate. For comparison, two additional data points are provided for each project. One is the average operating energy consumption for this building type, in a similar climate zone, based on NREL/DOE Commercial Building Energy Benchmarks, July 2008. The second reference point is the operating energy benchmark for this project, which is a software simulation for this specific building in its actual location, based on ASHRAE 90.1 energy consumption standard, and used as part of the LEED evaluation process. Note that this analysis covers operating energy only. The embodied energy of construction and maintenance over time is not included. Other metrics are important to measure a building's sustainability, including water use, waste generation, and others. Of all the metrics, energy is arguably the most significant in terms of the net environmental impact of a building over its lifetime, and is also the easiest to model , measure, and compare to other projects. For this reason, we document the energy performance of as many of our projects as possible.